The H-61A hand hydraulic pump pictured above is a completely redesigned to a dual stage pump designed to operate all single acting cylinders. The first stage rapidly pressurizes the system to 500 P.S.I. at which time the second stage automatically operates to provide operating pressures up to 10,000 P.S.I. of hydraulic pressure to the hydraulic cylinder. The H-61A pump has a large 122 cubic inch oil reservoir with the fill plug conveniently located under th handle. The pumps are equipped with an internal pressure relief valve meeting ANSI/ASME B310.1 Safety Standard and ISO 9001.208 Standard. The pump without hoses weighs 24 lbs. For those situations where weight or corrosion resistance is a consideration, the AH-61A pump is an aluminum version of this dual stage pump, The AH-61A pump has a smaller 62 cubic inch oil capacity reservoir. Weighing a mere 9 lbs. this pump also has an internal pressure relief valve meeting ANSI/ASME B310.1 Safety Standard and ISO 9001.208 Standard. Both the H-61A and AH-61A pumps are equipped with convenient top mounted reservoir filling ports, located under the pump handle, large carrying handles located under the pump operating lever and an oversized, side mounted hydraulic fluid control valve designed for easy operation while wearing gloves. A more compact pump is the Model H-2 pump is a single stage pump which has been completely redesigned to provide a compact steel bodied rapid acting pump with a 43 cubic inch oil reservoir, weighing in at 18 lbs. The H-2 pump is shown to the left. This pump's new features include the ability to be operated in the horizontal position, or in a vertical hose down position. Like the larger models, it also incorporates a convenient top mounted reservoir fill port located under the handle and a large easily gripped fluid control valve knob, that is designed to be operated while wearing gloves.The H-2 pump has a new handle mounting system and a larger base for more stable pumping while resting on uneven surfaces when used in the horizontal position. The H-2 pump, like its larger brothers, uses safe mineral oil to produce 10,000 P.S.I. of hydraulic pressure. The H-61A, AH-61A and H-2 pumps all use safe, non-corrosive, mineral type hydraulic oil. 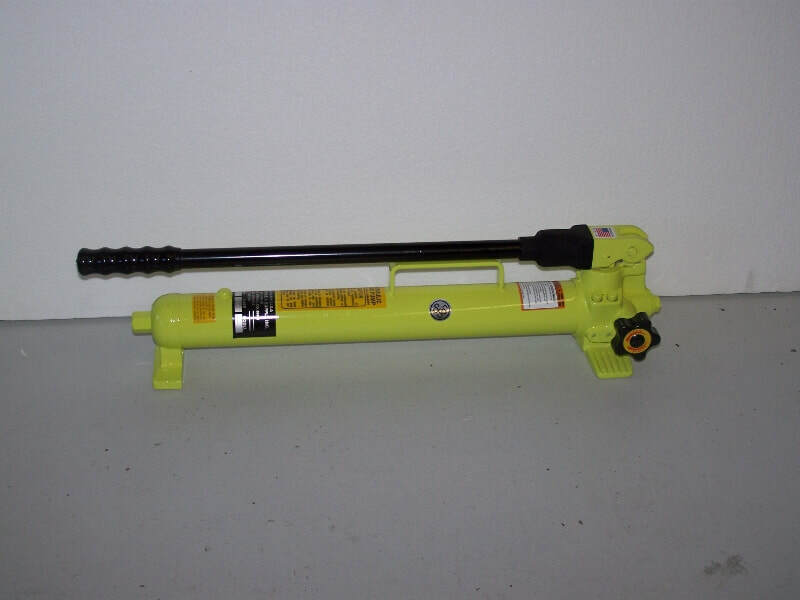 Hand Hydraulic Pumps ship via FedEx Ground®.